We had over 20 CNG members attend the International Myotonic Dystrophy Consortium (IDMC-11) meeting held in San Francisco, California, on September 5th to 9th, 2017. Scientific meetings and conferences are an important component of scientific research, training and collaboration. The IDMC-11 provided an opportunity to connect with other world-renowned researchers working in the myotonic dystrophy field and to hear about the exciting new findings in basic research and therapeutic studies. For graduate students and postdoctoral trainees it provides an opportunity to network, present their research, and form new collaborations with scientists in other locations around the world. Our researchers presented their recent findings including updates on myotonic dystrophy type 2, biomarker advances in DM, as well as, small molecule screens and CRISPR-dCas9 therapeutic approaches for DM. 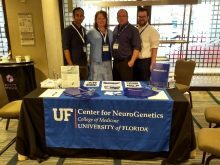 Our attendees also had the opportunity to participate in the Myotonic Dystrophy Foundation’s Conference right after the IDMC. This interaction opens a completely new world for trainees who may have never had the opportunity to interact with families affected by these diseases. Friendships are always made between CNG researchers and families during this conference and this close connection with DM families really reinforces the importance of the work we do at the CNG. It also brings a renewed energy to the CNG that helps drive our research into understanding myotonic dystrophy and the development of future therapeutic treatments. A new CNG inFocus Newsletter was handed out, which had a focus on the DM research being done here at the CNG, and you can find a copy of it by clicking here. Here is our table at the MDF conference with some of the CNG researchers that attended.